There’s no need to devote much more copy to last week’s Port of Bremerton Commission controversy. After talking to state officials this week it’s pretty clear there won’t be any formal inquiries into whether commissioners violated the Open Public Meetings Act, outside of routine auditing. Commission President Roger Zabinski has apologized for the way he brought his concerns to the table. The episode will probably blow over. Before I leave this topic alone, however, I want to share a couple of documents and context I’ve collected over the last week, which shed some light on the issues Zabinski was initially trying to raise. Zabinksi was concerned emails and phone calls made between Port CEO Jim Rothlin and commissioners outside of a public meeting constituted a “serial meeting,” which would violate the Open Public Meetings Act. It also appears the email from Rothlin and response from commissioners bordered on “polling,” which can violate the act. 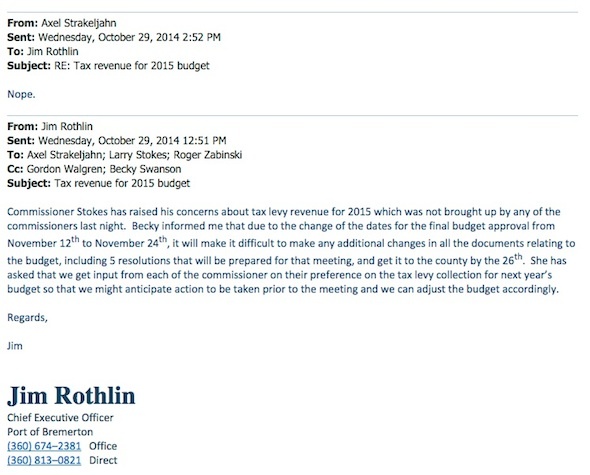 First, here’s the Oct. 29 email sent by Rothlin to the commissioners asking whether they wanted to keep a tax levy increase in the 2015 budget. Rothlin sent the email after a lengthy Oct. 28 preliminary budget workshop (see this story for more background).